About The Show This show is a fast paced roller coaster ride of fun. Completely choreographed to music, it allows audience members to venture into the fascinating world of the subconscious mind, whose boundaries are only that of imagination. The volunteers are the stars of the show! It’s like getting a dozen entertainers for the price of one. You will laugh hysterically as James Kellogg Jr. takes audience volunteers on a guided tour through their imaginations with HILARIOUS results! They will experience laughter, fear, excitement, greed – some will become celebrities – right before your eyes! You will be amazed at the unbelievable hidden talent your spouse, friends or coworkers will demonstrate when under hypnosis. All of their inhibitions are gone and they have the time of their lives! When awaked, they will feel like they just came back from a long vacation or slept better than they can remember. They awaken refreshed and feeling great! Even the hard-core skeptics will walk away from this show believing the impossible and be thoroughly convinced. Hypnosis is a VERY real thing and now you can see it for yourself! 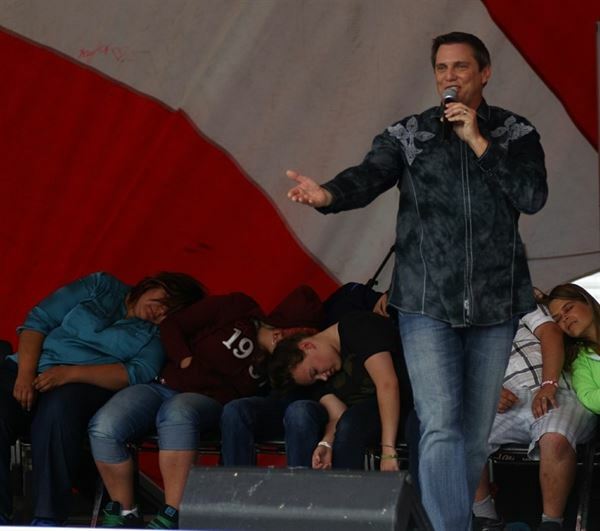 Stage hypnosis is the only form of entertainment where the volunteer audience members literally become the stars of the show. You will be talking about this show for days...while some of the surprised volunteers still have no idea what they did on stage! It is a superb performance filled with intrigue and laughter. Who Is James Kellogg Jr? James Kellogg Jr. is a Master Hypnotist, a Registered and Certified Hypnotherapist and a Master Magician. He has been delighting audiences with his magic since he was 7 years old. He knew he was hooked for life when he won the Gong Show at the age of 10. He is of the most sought after performers today. His stage credits are quite extensive including; Television, Film, Radio and literally thousands of Casino Performances, Corporate events, Colleges, High Schools, Fairs & Festivals around the country and overseas. Mr. Kellogg’s affiliations and some highlights from his career include: •	Member, American Board of Hypnotherapy •	Member, National Guild of Hypnotists •	Member, Academy of Magical Arts, Inc. (Magic Castle) •	Member, International Brotherhood of Magicians •	Member, Society of American Magicians •	Member, Magic Guild of Southern California •	Member, The Magic Castle •	Headline Act for numerous stage productions including “A Magical Night", Brooks Theater, “A Night of Magic”, Fallbrook Theater, and many more. •	Featured Corporate Magician for: Legoland California, Morton Salt, Southwest Airlines, Mercedes Benz, Allstate Insurance Co., Home Depot, United Airlines, Southern California Edison, Washington Mutual Bank, Hilton Hotels, Callaway Golf, Union Pacific Railroad, and many more. •	Recent Performances include: Featured on TLC’s hit show LA INK when he hypnotized Kat Von D to quit smoking, Knott’s Berry Farm, Legoland California, Harrah’s Rincon Casino and numerous private appearances at High Schools, Colleges, Universities and Military events.